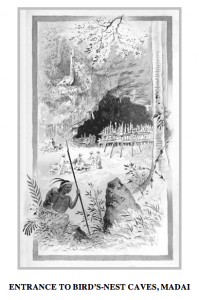 Back on the trail of Annie Brassey, and I’ve made a brief diversion to Borneo. It has temporarily taken me further away from Australia, but having heard a little about Annie’s time here made it a place not to miss. 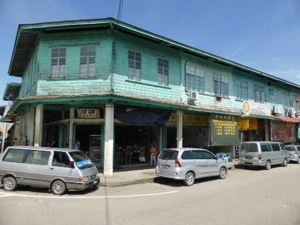 Annie visited the Darvel Valley area (of what was then North Borneo) in search of bird’s nests. It had also been thought that this search through caves had been the place she contracted malaria (surely I had to visit). The prized bird’s nests of the swiftlets in Borneo are now harvested with a little more attention to health and safety and sustainability than might have been the case when Annie visited. Her photos and journal indicate that the harvesting of bird’s nests was something of a high risk and precarious activity. 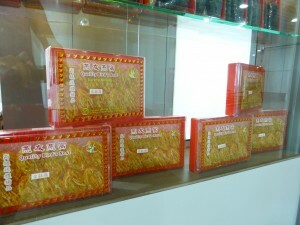 Albeit for high returns. Darvel Valley is now an area of significant scientific interest and conservation. 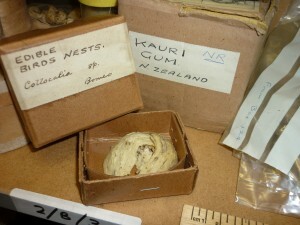 The white bird’s nest that Annie collected from her visit to the Madai caves is now held at Bexhill Museum. 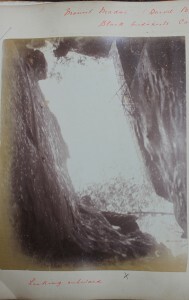 She had also wanted to visit another cave, the Gomantong caves which, after sending a couple of people from the voyage off to do ‘a reckie’ she was eventually persuaded that these were not accessible, she wouldn’t be able to visit. 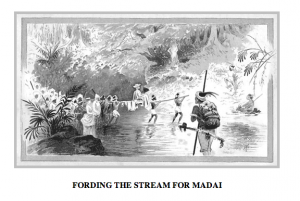 The two men in question having waded arm pit deep through swamps, hacked through jungle and swum not inconsiderable distances to find the caves before turning around to report back some days later. For me, alas, it is the Madai caves which are proving a little more elusive. 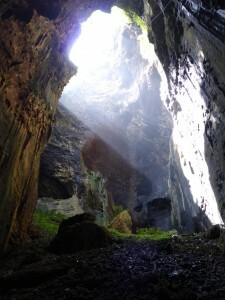 I have, however, been able to arrange to visit the Gomantong caves later this week. I think Annie would be pleased. In the mean time, while spending time in Sabah’s capital of Kota Kinabalu I have also been able to get back on the train. 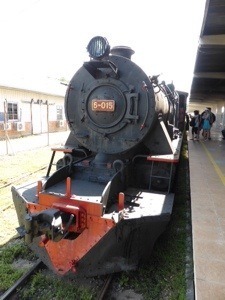 A tourist train, it is nonetheless the only stretch of railway in Borneo. 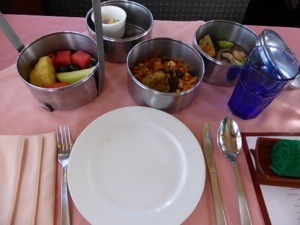 It is also advertised as serving breakfast and tiffin. For this alone it is worth the trip. Annie talks a great deal about tiffin. Understandably two of her greatest concerns seem to be where to eat, when, and who with, and where she will be spending the night. I have never ‘taken tiffin’ so am intrigued and looked forward to it with great anticipation. 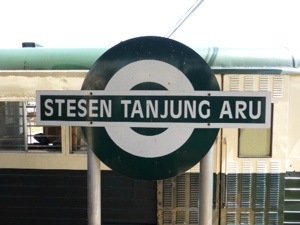 Arriving at Stesen Tanjung Aru I am greeted by a number of members of staff dressed in pressed cream outfits, long shorts and knee high socks for the men and pith helmets all round. The 1950’s and 1960’s music of the Everly Brothers, The Chordettes ‘Mr Sandman’ and Danny and the Juniors ‘At the hop’ emitting in and around the turn of the century steam engine from Lancashire (and Japanese carriages) only adds to the slightly surreal sense of time and place. It is not for the first time I consider Kota Kinabalu to be slightly off centre (I was greeted by a life sized horse with a lampshade on its head in my hotel). 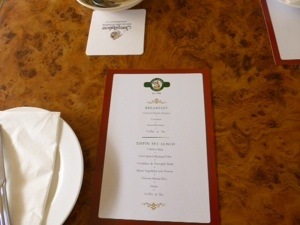 We are issued with passports, menus and fans before sitting down at designated tables and wait to depart. The tables are all set for breakfast and iced lemon tea is served. As we pull out of the station, a selection of pastries and tea and coffee is distributed. The scenery as we leave the city behind changes to a coastal view with wooden houses on stilts in the sea, before returning inland and watching the change from greenery and rivers to small collections of wooden houses, interspersed with new constructions of brick and metal. Most of Kota Kinabalu is built on reclaimed land, almost 90% in the last 30 years. 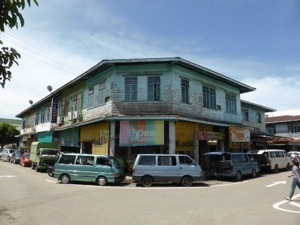 The first place we stop is Kinarut, a small town which is mostly made up of old wooden buildings and a variety of shops. It all looks a little ramshackle and only adds to the sense of another time. 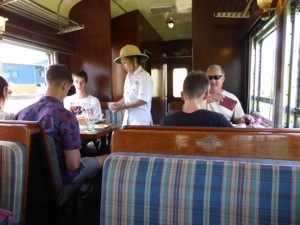 After a short stop we return to the train and our final destination, where we get out again for a stroll around Papar and it’s market. The locals greet us rather bemused. The layers of references to different times, places and periods in history makes it feel slightly disorientating and perhaps the kind of place and time when I might even have bumped into Annie. Papar, the end of the North Borneo Railway line. Passports are stamped and iced tea is served. Tiffin! Four fabulous dishes served as we leave Papar on the return journey to Kota Kinabalu. 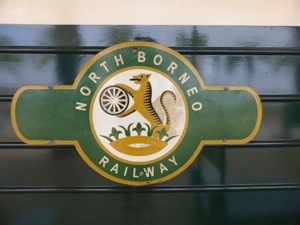 This entry was posted in Annie Brassey, train travel and tagged Annie Brassey, bird's nests, Borneo, caves, Malaysia, North Borneo Railway, Sabah on January 29, 2014 by Louise Kenward.